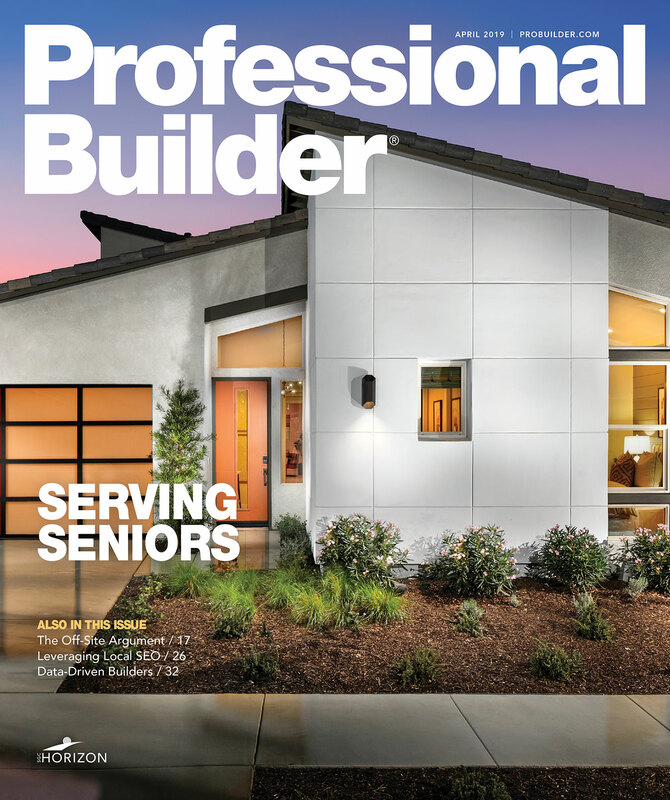 To see products in the other 2018 Top 100 categories, click here. For Legacy OSB subfloor, LP worked with Gorilla Glue on waterproof resins that would coat and bind each wood strand for better performance and increased moisture resistance. Its high density makes the product ideal for hardwood floors, tile applications, and large homes that may be exposed to the elements during construction, and provides exceptional fastener holding strength and a quieter sub-floor to foot traffic, the company says. 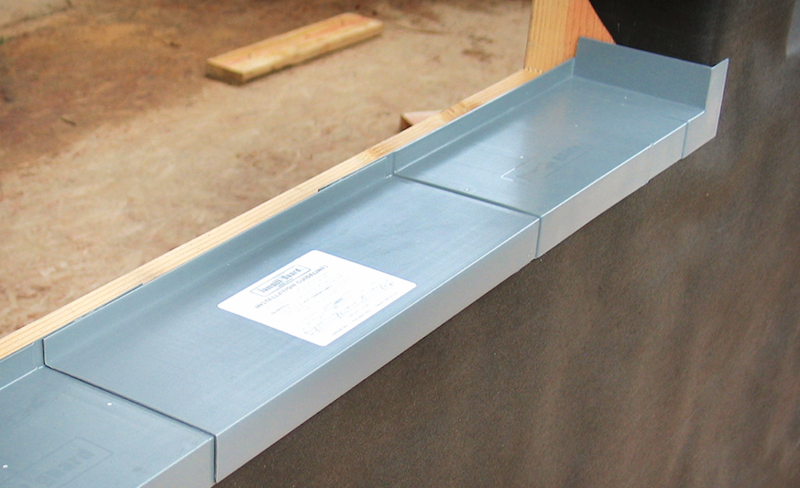 In addition, the ends of every panel are notched so rainwater can drain during construction. CertainTeed offers MemBrain Continuous Air Barrier and Smart Vapor Retarder for greater control over moisture in the home. 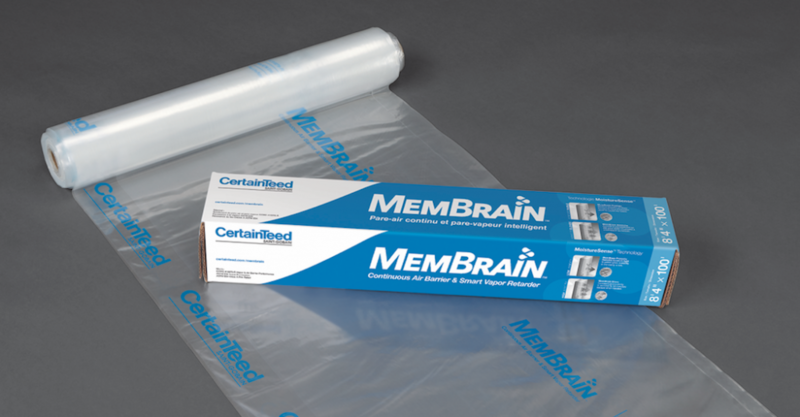 In low-humidity conditions, MemBrain stays tight to keep moisture from entering. In high humidity, the air barrier increases permeability to let moisture escape. For use in ceilings, basements, bathrooms, and other areas, MemBrain is an alternative to traditional poly­ethylene insulation products. Available in 9-foot and 10-foot lengths, TallWall OSB wall sheathing was the first longer-length wall sheathing on the market, the manufacturer says. 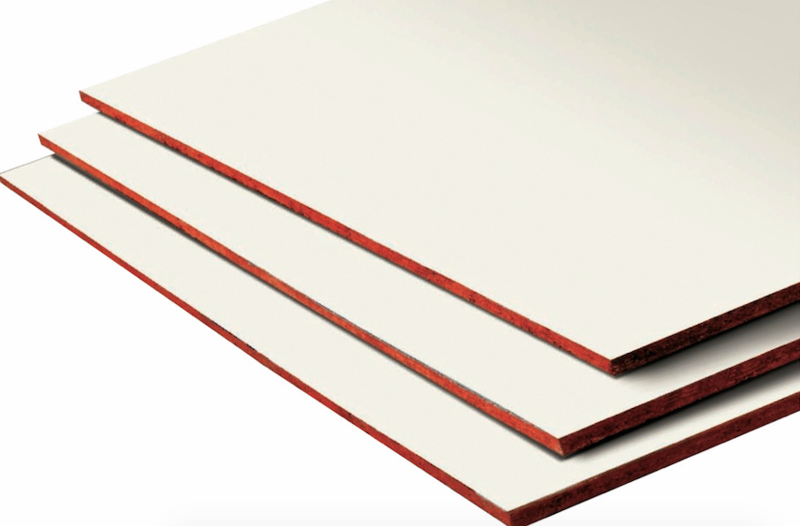 In addition to speeding up installation, with less cutting and handling, TallWall also provides other advantages when compared with traditional 4-by-8 wall sheathing installed horizontally, offering a sharp reduction in air leakage—up to 60 percent compared with 4-by-8 panels installed horizontally under the same conditions. TallWall meets and exceeds PS 2 standards and is approved in all North American building codes. It has no added urea-formaldehyde resins. Made from high-impact plastics, Jamsill Guard adjustable sill pan flashing has sloped weep areas that help evacuate moisture to the home’s exterior, preventing damage from window and door leaks. The flashing features one-piece molded corners, so no leaks occur at that joint. Available in depths from 1 1/8 inches to 6 13/16 inches, the flashing is easy to install and won’t deteriorate over time, the company says. The telescoping design allows on-site adjustment to fit any rough opening. 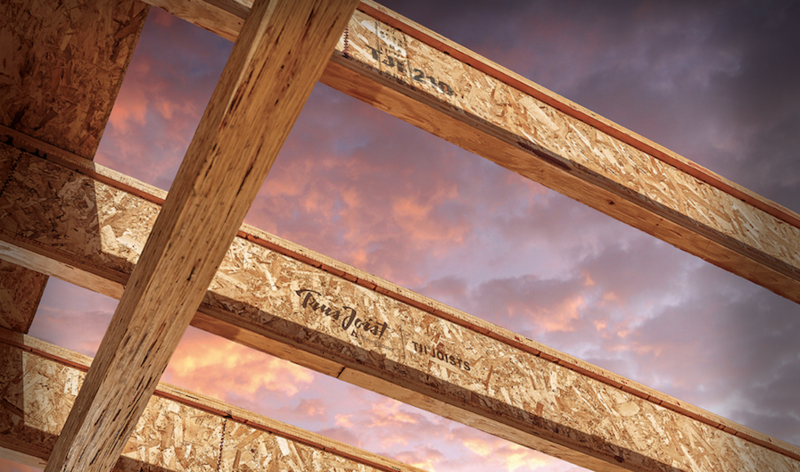 TJI joists offer dimensional stability to help resist the warping, twisting, and shrinking that can lead to squeaky floors. Joists are lightweight and available in long lengths, offering design versatility and fast installation. No special tools or training are required—builders can cut and drill the joists as usual and use standard hangers for quick, smooth installation. Weyerhaeuser also offers software to help builders manage inventories. According to the manufacturer, TamlynWrap’s design removes at least 100 times more bulk (liquid) water from a wall than flat housewrap by means of its patented gap design. The housewrap functions as one part of the Tamlyn Water Management System. In order to get the 15-year limited materials and labor warranty, Tamlyn requires the use of its complete system of products. 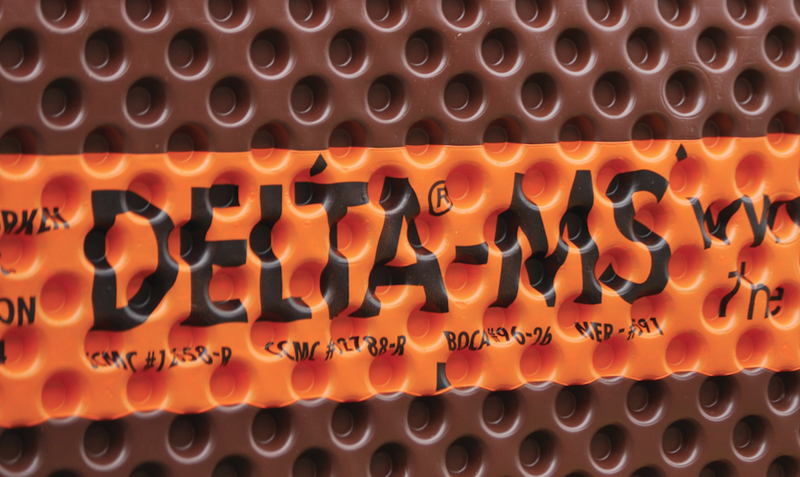 The Delta-MS foundation protection system keeps basements dry with Air-Gap Technology. Unlike sprays, which may crack when concrete walls crack, Delta-MS bridges cracks so no water intrusion can occur, the company says. Made from 60 percent recycled and 40 percent virgin materials, the product’s co-extrusion process and offset dimples create higher compressive strength and impact resistance. Delta-MS requires no special equipment for installation, and there is no curing period, so installation is easier, the company says. 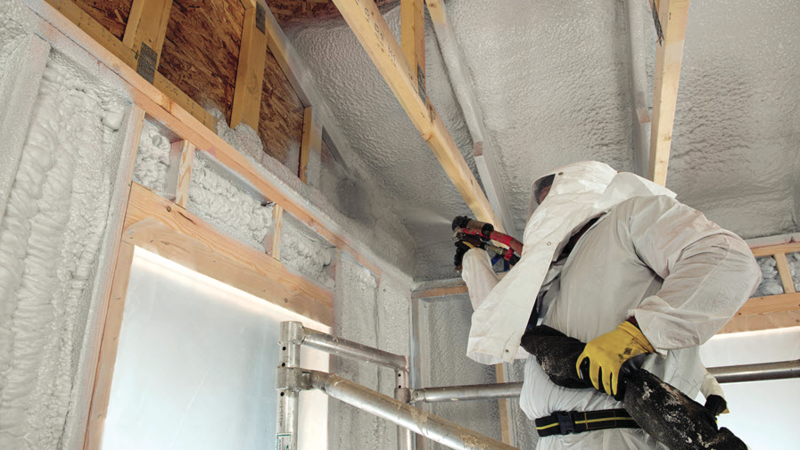 Foam-Lok 400 Spray Polyurethane Foam Insulation is an open-cell solution that maintains a home’s comfort and temperature—and reduces noise and moisture—by sealing the structure to create a continuous air barrier, which reduces heat transfer. The spray-applied material provides ultra-high yield and enhanced energy efficiency in attics, cavity walls, and other crucial areas around the home. Foam-Lok 400 adheres to framing members and substrates and can be used to fill stud-wall construction in a single application. It meets building code requirements without the need for an additional ignition barrier. The LSSJ field-adjustable jack hanger aims to simplify the way jack rafters connect to roof framing hips and valleys. A hinged seat adjusts to typical rafter slopes. The hanger ships pre-bent with a 45-degree skew, ready to place for the most typical rafter conditions. It can be installed as a retrofit, enabling installers to first tack all rafters into place and install the hanger later. Available skewed left or skewed right. Nail holes are easily accessible on one side using a hammer or nail gun. FlameBlock Fire-Rated OSB Sheathing is an ICC-certified component of 1-hour and 2-hour fire-rated wall assemblies and roof deck applications that, the company says, offers advantages over gypsum and FRT plywood. FlameBlock can be used in both interior and exterior wall assemblies and on roof decks, lowering costs by simplifying installation and reducing the need for additional materials. M2Tech Moisture & Mold Resistant Drywall protects baths, kitchens, and other spaces from high humidity and moisture and protects against mold growth. For use on interior walls and ceilings, the product is also available in Type X for enhanced fire resistance. The drywall achieves less than 5 percent water absorption by weight after 2-hour immersion per ASTM C473 test methods and has both a GreenGuard Gold and GreenGuard Indoor Air Quality certification. 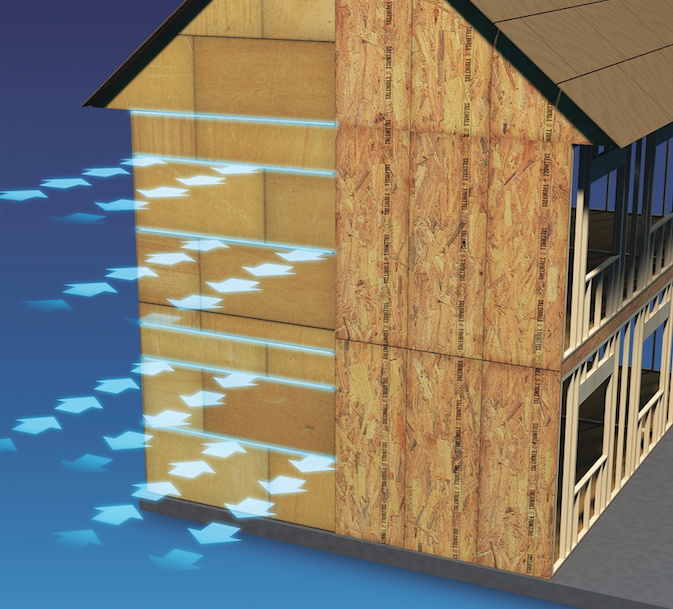 The ForceField air and water barrier system from Georgia-Pacific consists of structural engineered wood sheathing panels laminated with an air and water barrier. For a code-compliant, integrated building envelope that eliminates the need for housewrap, seams between installed panels are taped using ForceField seam tape. 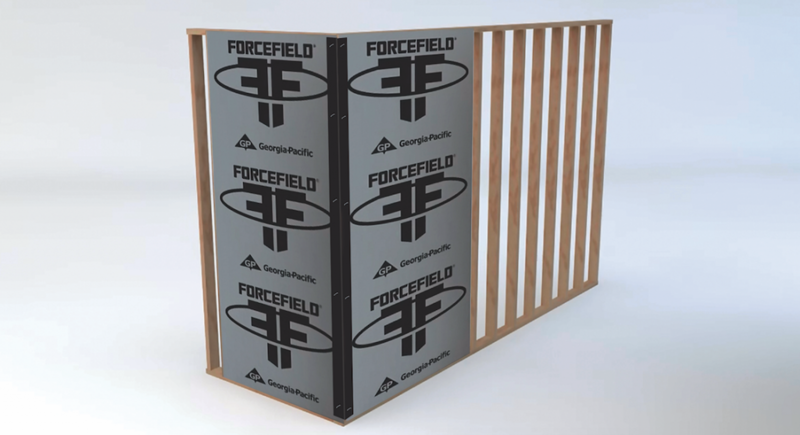 ForceField keeps out water and prevents air infiltration but is permeable, allowing water vapor to escape. Panels are 7/16 inch thick and are available in 4x8-, 4x9-, and 4x10-foot sizes. 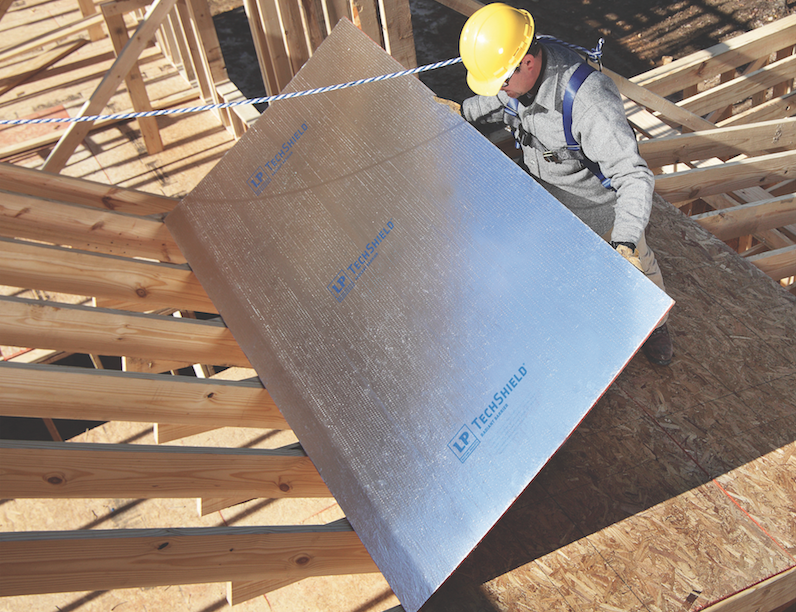 Available in warm climate regions throughout the U.S., LP TechShield Radiant Barrier Sheathing is designed to lower attic temperature and boost energy efficiency, the company says. A thin, durable sheet of aluminum is laminated to LP’s OSB sheathing. VaporVents technology allows the panel to dry more quickly from construction moisture than other radiant barrier sheathing, the company says. Tech­Shield requires no additional labor for installation. Block-It House Wrap is a U.S.-made drainage wrap that provides a breathable barrier and prevents moisture penetration with a channeling design to direct liquid water away from the building and onto the ground. UV inhibitors in Block-It provide protection from ultraviolet light for up to six months. The housewrap resists tears, abrasions, and punctures and doesn’t snag on nails or equipment. It is GreenGuard Gold certified. 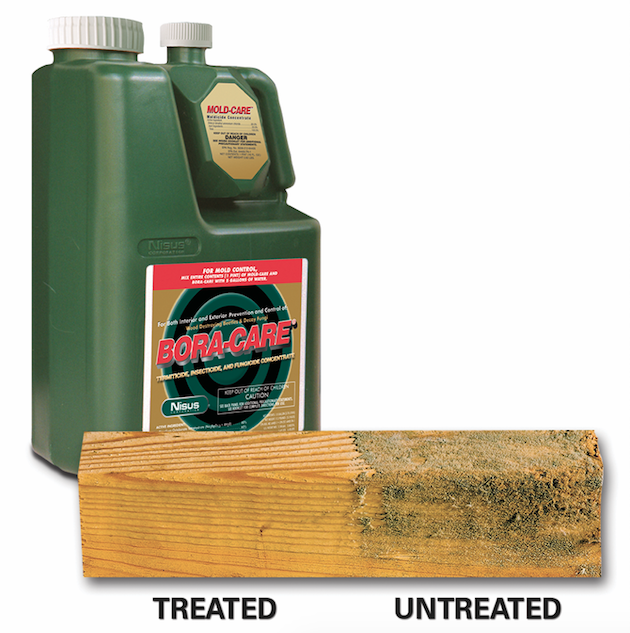 Bora-Care With Mold-Care is a borate-based wood preservative that requires a single application to create a protective barrier against mold and fungi, termites, and other wood-destroying pests. It diffuses into the wood, providing residual protection. Bora-Care can be directly applied to wood in the whole house or in high-risk areas during the dry-in phase of construction. The Corbond line has two closed-cell spray foams: Corbond MCS and Corbond III (shown); and two open-cell products for use in walls, floors, attics, and ceilings: Corbond Open-Cell Spray Foam (R-3.8 per inch) and Corbond Open-Cell Appendix X Spray Foam (R-3.7 per inch), with the latter designed for application without an ignition barrier. 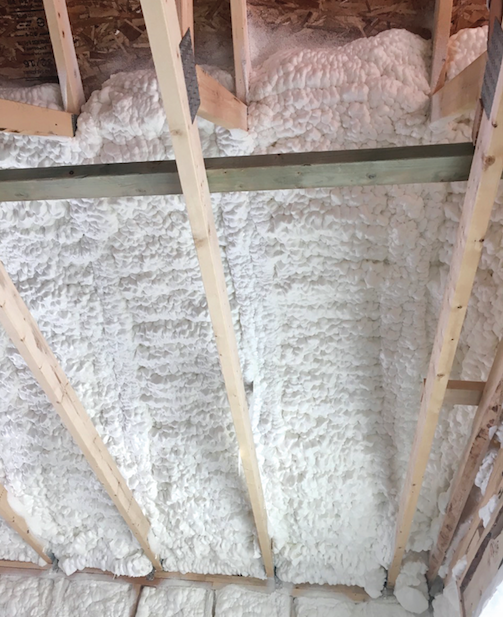 Both MCS and III can be installed alone or combined with JM formaldehyde-free fiberglass insulation as part of a hybrid system.